Quality Policy - Kwadrat Sp. z o.o. KWADRAT Sp. z o.o. 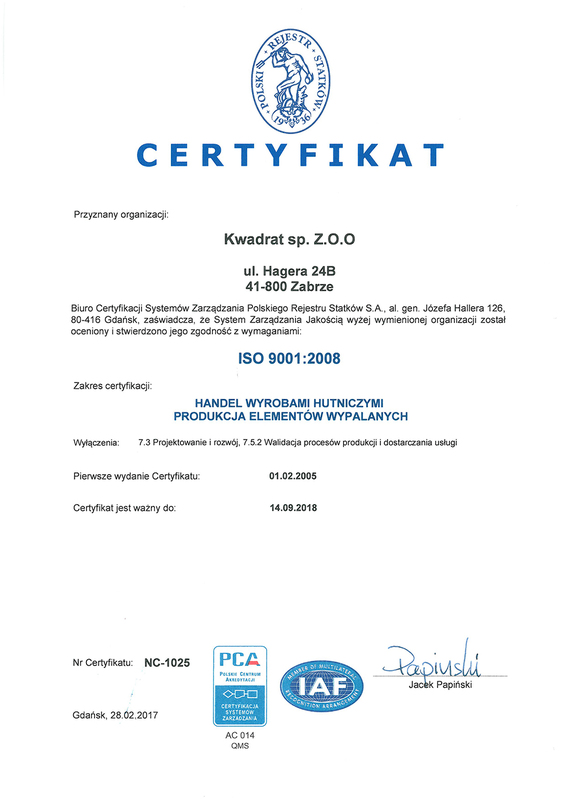 owns valued and recognized around the world quality management system certificate ISO 9001, which is to give assurance to our customers that the company chooses solutions for high quality in all its activities. Our company has implemented this system for the trading of metallurgical products, and soon also for our production activity. It successfully passed a series of controlling checks and fulfilled the high standards of i.e. quality of analysis of customer needs and requirements, relations with suppliers and trading partners that they are based on mutual respect and favorable agreements which guarantees the highest quality of service. We were also assessed by our facilities and human capital in terms of qualifications, organizational skills, capacity and efficiency. We have developed schemes of action that allow, among others, very efficient loading and unloading of materials in the warehouse, which is repeatedly emphasized by our trading partners.